A melting pot. A bento box. Chop suey. Wontons with chips. Hawaii is such an assortment of races, ethnicities, and cultures that it’s hard to pick just one way to describe its unique mix. So what can it teach the rest of America about how different people can all live together? 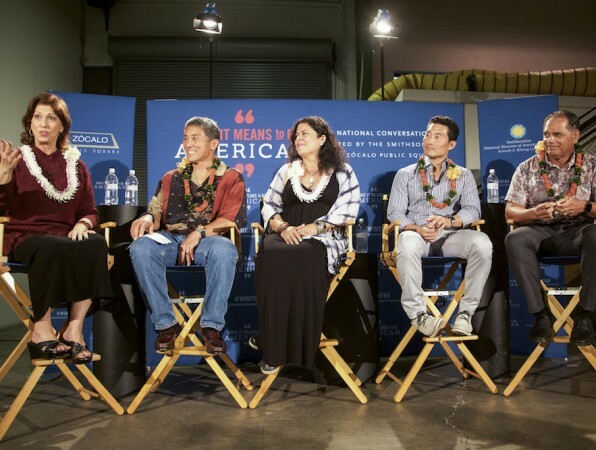 In front of a lively full house at the Kaka‘ako Agora in Honolulu, a panel moderated by Leslie Wilcox of PBS Hawaii took on this question at a Zócalo/Smithsonian “What It Means to Be American” event in partnership with the Daniel K. Inouye Institute. Maya Soetoro-Ng, who is the director of community outreach and global learning for the Matsunaga Institute for Peace and Conflict Resolution at the University of Hawaii at Manoa, said that Hawaii, of course, is not perfect, but she is glad her daughter is growing up here. 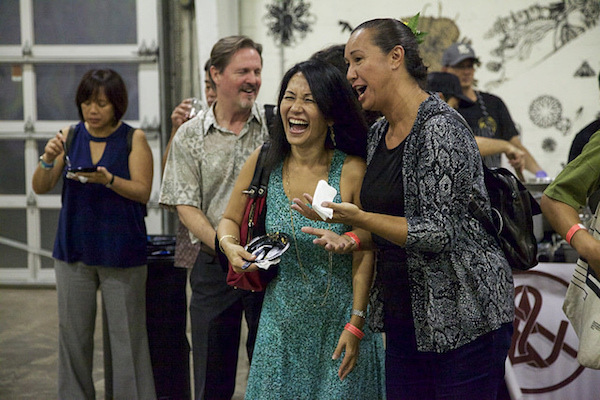 She relayed a story about her husband Konrad Ng, who directs the Smithsonian Asian Pacific American Program and didn’t grow up in Hawaii. As a kid, some bullies pushed him off his bike and made jokes about his Chinese heritage. She cited a festival celebrating Okinawan heritage, the practice of taro farming, and indigenous reforestation projects as examples of the state’s residents celebrating where they’ve come from. 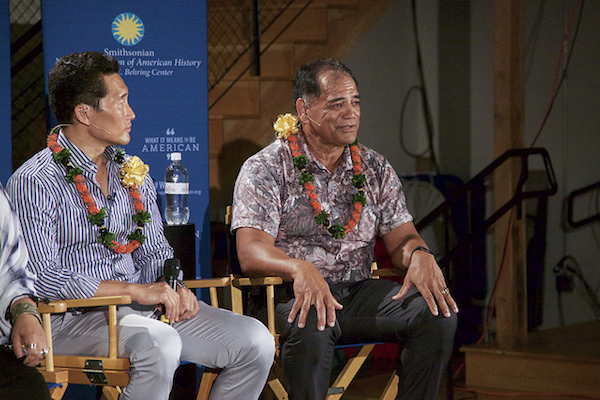 “One of most refreshing things about living here is there is an awareness about race, but not a judgment about race,” said Daniel Dae Kim, the actor best known for his roles on Lost and Hawaii Five-O. He shared a similar story to Soetoro-Ng’s that showed the contrast between his own upbringing in Bethlehem, Pennsylvania, and his son’s experience in Hawaii. 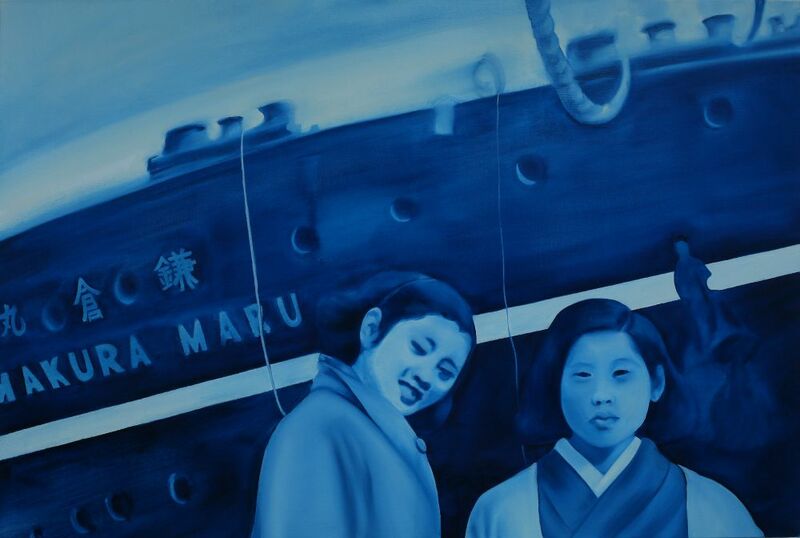 When Kim was growing up, his family, which had emigrated from South Korea, was the only Asian family in town, and he was regularly singled out. “The word ‘chink’ for me was something I heard as much as I heard love or hate,” he said. What makes Hawaii unique is that “there’s a great mixture and you grew up around it,” explained Corbett Kalama, vice president of real estate investments and community affairs with the Harry and Jeanette Weinberg Foundation. He talked about growing up with a heritage that included Native Hawaiian, Chinese, Portuguese, and Danish roots. “I’m local,” he said, to laughs from the audience. 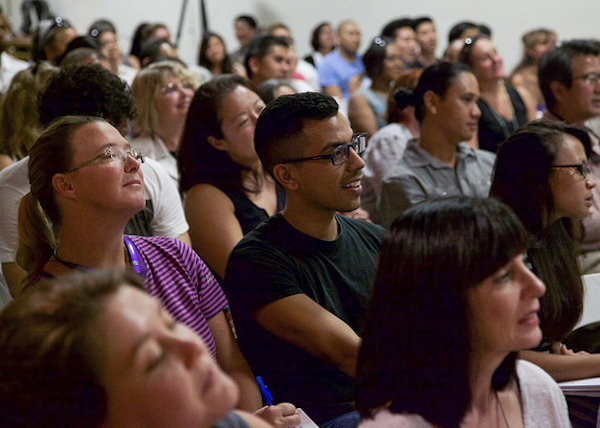 Yet Wilcox asked the panelists to acknowledge that Hawaii isn’t a total racial paradise. “We might be able to teach [the rest of America] by examples that are not flattering as well,” she said. Kalama agreed. He talked about when he and his wife, who is blonde and blue-eyed, check out at supermarkets, clerks don’t assume they are together. “My initial reaction was burning on inside,” he said. But he learned to chuckle and say that they are indeed married and point out how lucky he is. 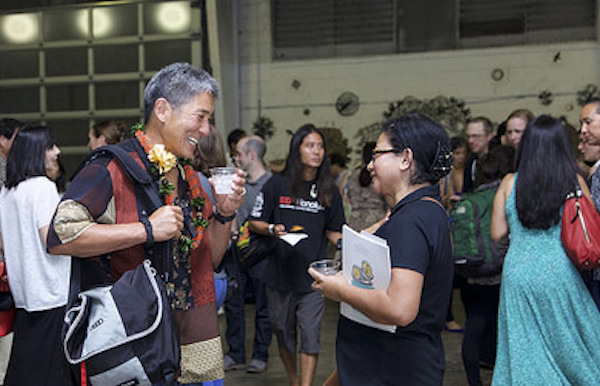 Marketing executive Guy Kawasaki added that he didn’t think “the mainland is so heinous.” He said he has never felt as if his Japanese heritage has held him back. 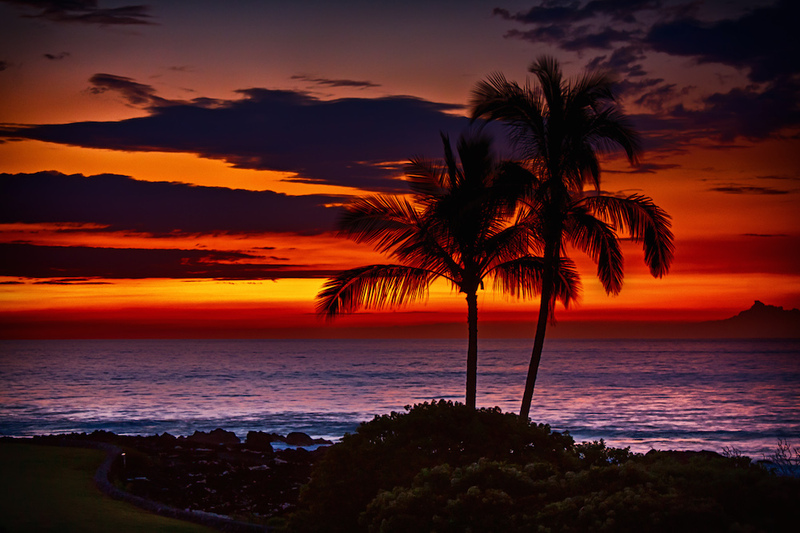 He attributes that to his upbringing in Hawaii. 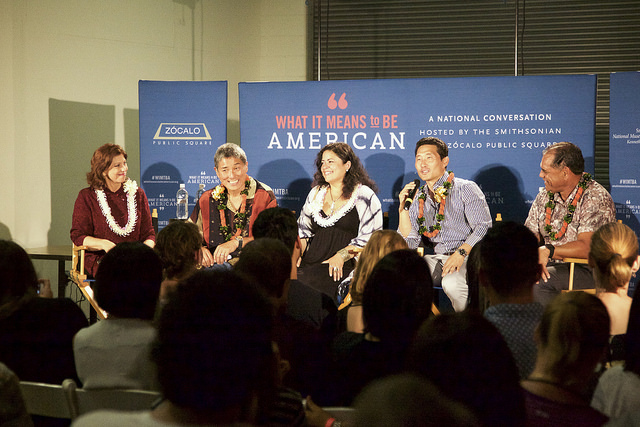 And while the panelists couldn’t agree on which metaphor was most appropriate for Hawaii’s mixing of races, cultures, and ethnicities, Kim did offer a riff on how he liked to think of Hawaii. 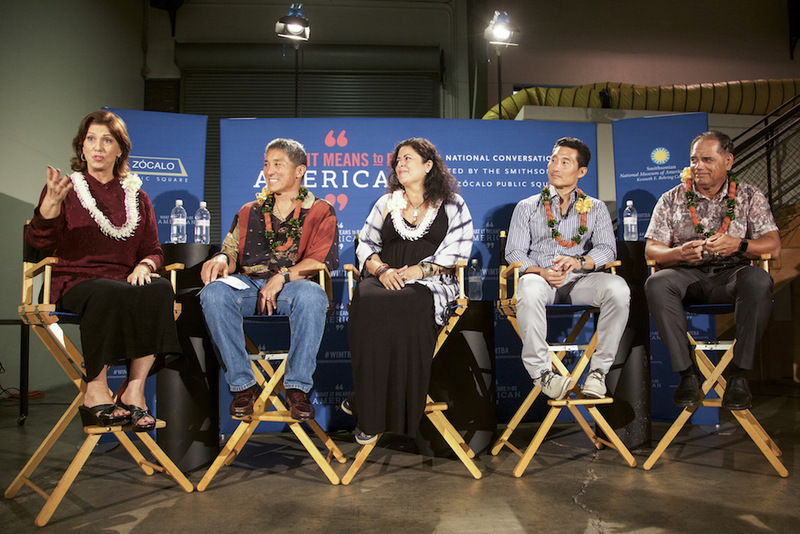 In the question-and-answer session, the panelists’ belief in the importance of empathy—toward Native Hawaiians, Micronesians, and others—became apparent. Soetoro-Ng shared a lesson she learned via social media. “My brother has some detractors,” she said, referring to President Barack Obama. After the laughter died down, she talked about how one of these detractors found her on Facebook and said some terrible things about her family. So she looked at this woman’s Facebook page. Sure, she saw things that showed their differences—this woman was a supporter of the Tea Party and posted a picture of a woman wrapped in an American flag toting a rifle. But when she looked a little deeper, she saw some pictures of her kissing kittens and pictures with her beautiful children. To close out the night, Kalama led the crowd in a rendition of the revered anthem of “Hawaii Aloha.” Everyone in the crowd began holding hands without prompting. The harmonies filled the room. 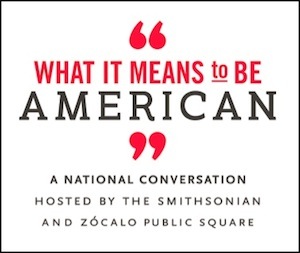 This event was produced for What It Means to Be American, a national conversation hosted by the Smithsonian and Zócalo Public Square. 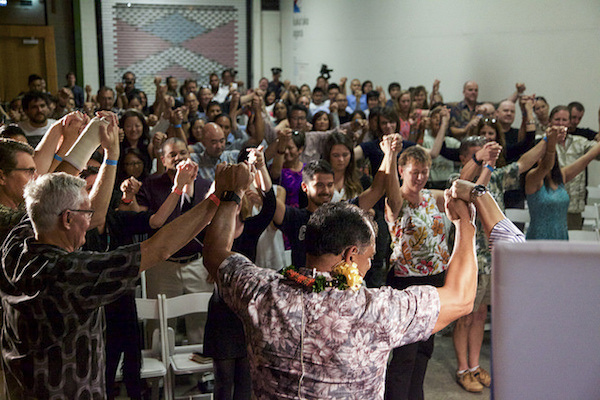 Guests and panelists sing "Hawaii Aloha"